Hathor is the sky goddess of love, beauty and motherhood. She is also the goddess of mining, foreign lands, and music. Hathor, Mehturt, Mehurt, Mehet-Weret, Mehet-uret. While Hathor is the most commonly used name, Mehturt and the other variations have served as alternate names for over 3,000 years. While Hathor means “mansion of Horus,” Mehturt means “great flood,” a reference to her connection to the Milky Way. In addition to these names there are two manifestations of Hathor. The first is Hesat, which is the earthly form of Hathor. In her earthly form Hathor was depicted as a cow-goddess. The name Hesat meant milk and was most likely given because of her role as “the one who creates all nourishment.” In most depictions she is shown as a white cow with milk gracefully flowing from her udders alongside balancing a dish of food on her horns. Hesat was said to be the mother of Anubis. The earthly manifestation of Ra, Mnevis, is the father of Anubis, creating a divine triad that was worshipped together. Hesat had a dualistic relationship with Anubis as her role was to bring life; whereas, Anubis was known as the God of Death and associated with taking life away. The second manifestation is Nebethetepet. This manifestation resided at Heliopolis, where she was associated with Atum. The name Nebethetepet means “mistress of the offering.” Thereafter, and once the Ancient Egyptians began to interact with Greece and Rome, Hathor came to be associated with Aphrodite and Venus respectively. Along with being one of the most important goddesses in the Egyptian pantheon, Hathor is also known for the many complex relationships to various deities. For example, Hathor is at times depicted as the daughter of Ra, but at other times she is seen as Ra’s mother. Other times she is considered the eye of Ra. In one creation myth, Hathor gave birth to Ra each morning on the Eastern horizon as the sun rises. Another god that Hathor has a complex relationship with is Horus. The importance of this relationship is demonstrated in Hathor’s name, which means “mansion of Horus.” Although Horus is traditionally described as the son of Isis and Osiris, other traditions regard Hathor as his mother. In the form Heru-ur, meaning “Horus the Elder,” Hathor is his wife. Her other relationships include having Shu, Tefnut, Bast and Serket as siblings. Hathor was also at times seen as the consort of Sobek and Thoth in addition to Horus and Ra. It is these many complex relationships that make this goddess extraordinary and yet puzzling and possibly gives some insight into the thinking of the populations along the way. Hathor, in addition to the goddess Nut, was often associated with the Milky Way. During Ancient Egyptian times the Milky Way would align with the path of the sun during the fall and spring equinoxes. This led the Egyptians to view the Milky Way as “The Nile in the Sky.” They believed that the Milky Way was traveled by the sun god and the moon, and that Hathor was responsible for the yearly flooding of the Nile. This event was therefore taken as a sign that a child would be born soon as they related the flooding to the breaking of the amniotic sac; this all ties in with Hathor’s role as goddess of motherhood. Another belief was that the Milky Way was Wadjet, a giant snake they believed to be the protector of Egypt. Because of this Hathor was also closely associated with Wadjet. The cult of Hathor, who worshipped her as the goddess of fertility, is thought to have originated in the pre-dynastic period. It was believed that Hathor played a special role during the birthing process, and that she provided protection and sustenance for newborns. One of her major symbols was the Menat necklace, which was used as a ritual item. It was worn and used as a rattle, as it was often associated with fertility and the womb. The goddess of fertility was only one of Hathor’s roles, but was possibly the most important of the vast number of roles that she served. The most important temple to Hathor was the temple at Dendera in Upper Egypt. It is the earliest known temple to Hathor, and her importance there earned her the title “Mistress of Dendera.” During the First Intermediate Period, the cult of Hathor began to view her as both the mother and consort of Horus. 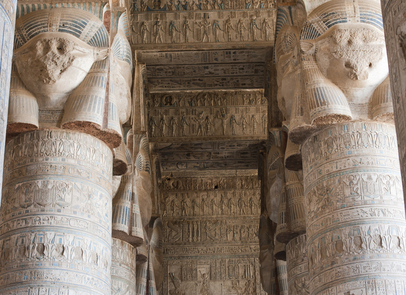 The temple is well known today as one, if not the best, preserved temples in Egypt. The building found there dates to the Ptolemaic dynasty, although the foundations of older buildings can be seen as well. Another temple exists in Gebelein, a town located on the Nile. The remains of the temple include multiple cartouches on bricks along with a royal stela dated to sometime during the 2nd or 3rd Dynasty. There are various other temples dedicated to Hathor, such as the one at Philae Island, and the Hathor Chapel at the Mortuary Temple of Queen Hatshepsut. There is also a temple dedicated to Hathor and Ma’at at Deir el-Medina. After the end of the war the people of Lower Egypt stopped obeying Ra. Hathor was informed that the people of Lower Egypt planned to revolt and assassinate Ra, which angered her greatly. The anger within her swelled and she became Sekhmet, the war goddess of Upper Egypt. She went on a rampage and slaughtered the people of Lower Egypt. In order to stop Sekhmet, Ra formulated a plan in which he poured a vast amount of crimson beer on the ground. Thinking that the beer was blood, Sekhmet drank it from the ground, and after becoming intoxicated she returned to her normal form as Hathor. 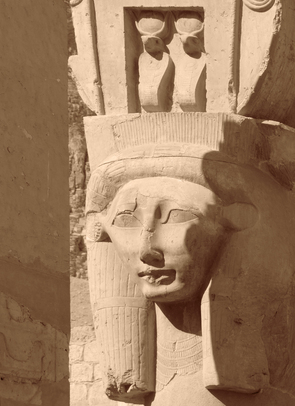 Archaeologists have found many statues and images of Hathor. One of the most important findings was the Narmer Palette, which dates to the 31st century BC. The hieroglyphics on the palette are some of the oldest examples that have been found. Archaeologists believe that it depicts the unification of Upper and Lower Egypt. It is a large palette that is believed to have been a ritual object, and is now housed at the Egyptian Museum in Cairo, Egypt. Hathor can be seen on the reverse side of the palette along with King Narmer and Horus in the form of a falcon. Another artifact that depicts Hathor is an urn found in Hierakonpolis that dates to the 1st Dynasty. The rim of the urn shows Hathor as a cow-headed deity with stars around its head. This is said to represent Hathor’s role as a sky-goddess. With Hathor’s depiction as a cow, she also came to be associated with Bat, another goddess who served a similar role in Ancient Egyptian mythology. Since Bat was associated with the Ba, or the soul, Hathor became associated with it as well. With this association, Hathor then became associated with the afterlife. She is depicted as greeting the dead in Duat, offering them food and drink. Due to this role, she is sometimes described as the “mistress of the necropolis.” Another connection with the afterlife came through the cult of Osiris. The Ancient Egyptians believed that the morally worthy would become an Osiris after death. By the time the Romans occupied the region, their beliefs changed to that morally worthy men would become an Osiris, while morally worthy women would become a Hathor; thus, giving this goddess even more status.